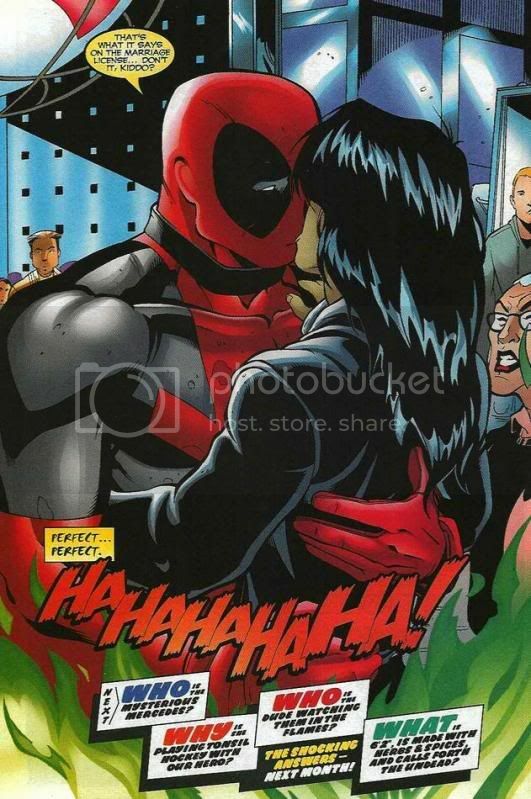 Deadpool Week: Who WAS that mysterious non-masked woman? 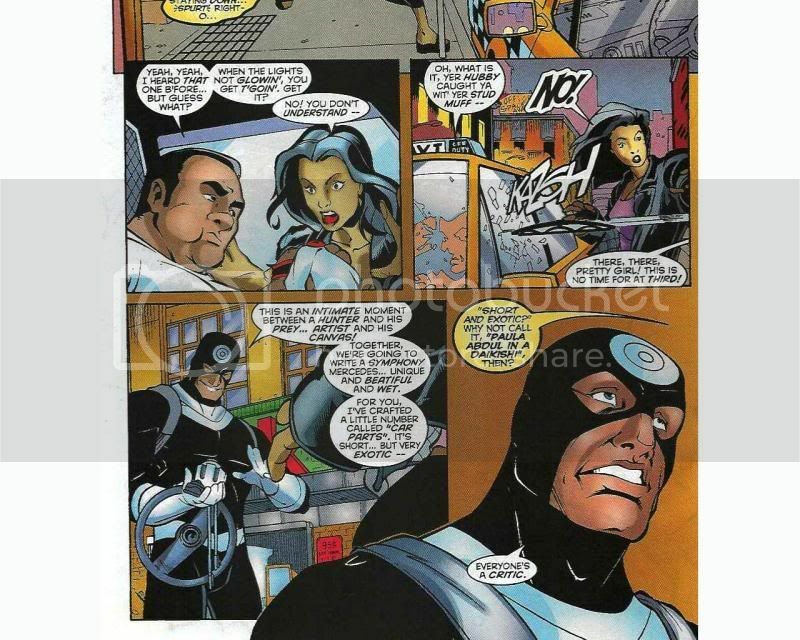 In an unprecedented event, our next set of scans is from the very next issue, #28! 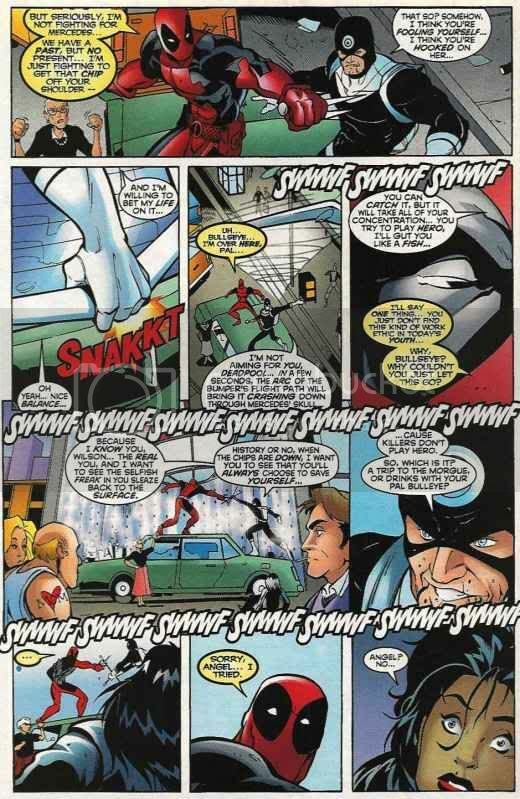 Not the whole issue, but at least we've got a bit of a continuing storyline here. Anyway. 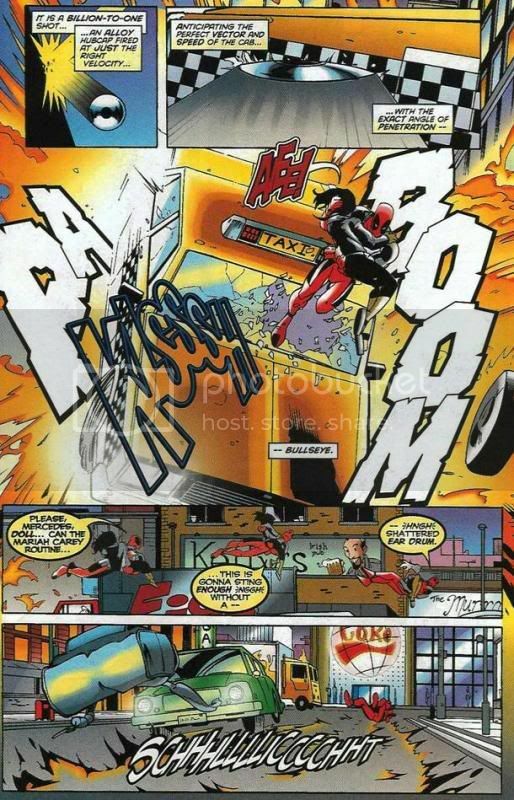 Deadpool: Just the thing to underscore all this culture and junk...Mayyy-h-e-m I'm gettin' hired for some mayyy-h-e-m-hem -- You can blow up a boat! You can strangle a goat! You can jump go carts over moaaats! Monty: You are so broken. Sadly, as we learn, the job he's been hired for is (shocking!) a trap. 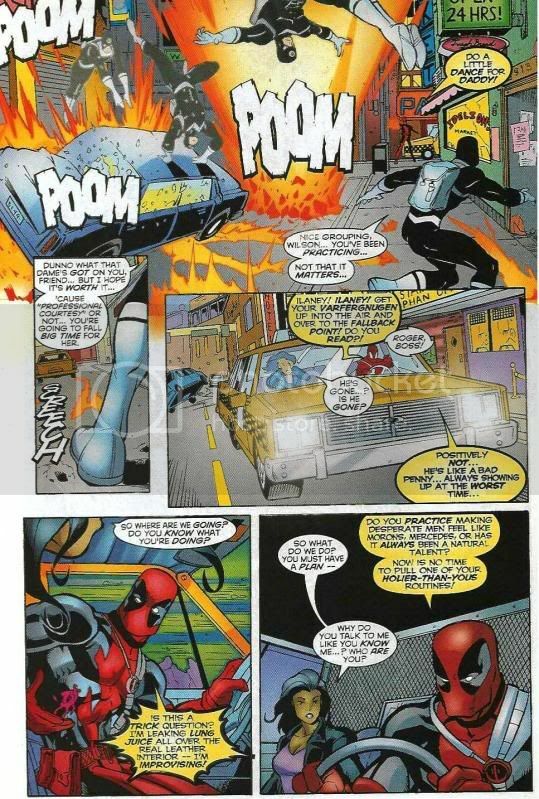 'Pool and Ilaney (his pilot, picked up in a previous story, she's blonde and German and slightly rotund) go down South for the job and the woman that Deadpool's been hallucinating runs smack into him while trying to escape from Bullseye (another merc). 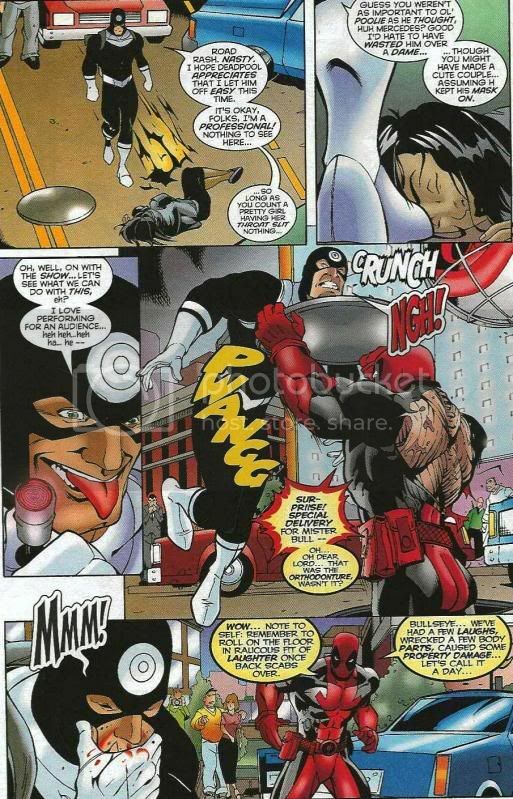 Meanwhile, back at the ranch, Monty, precog who tracked Deadpool's movements for almost 10 years, can't place the hallucination-woman at all, so he decides to ask a former co-worker (Zoe) for help. It's pretty good, although not his funniest I don't think, because of course they're setting up/dealing with more drama. Which can also be good, of course. "How ironic... how cliche... how ouchie." *snicker* Nice. I seem to be constantly following links to your journal these days for the awesome Deadpool stuffs...this time it was a Twitter link! A bit late but here a your missing scans. MANNNNN I NEED TO DO THAT META ON MERCEDES AND T-RAY THING. But dammit every time he meets an old flame or is all ♥_♥ with a woman, I go all to pieces. Gah, the whole T-Ray thing messes with my head sometimes. heh. I read #33 today where it's all laid out. 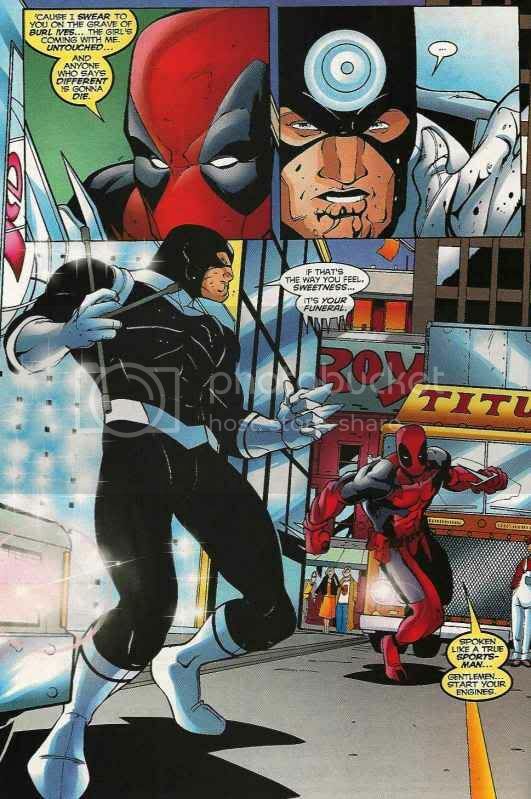 I felt so vindicated (even if T-Ray was Doin It Wrong showing Deadpool wearing his red/black costume in the flashbacks). 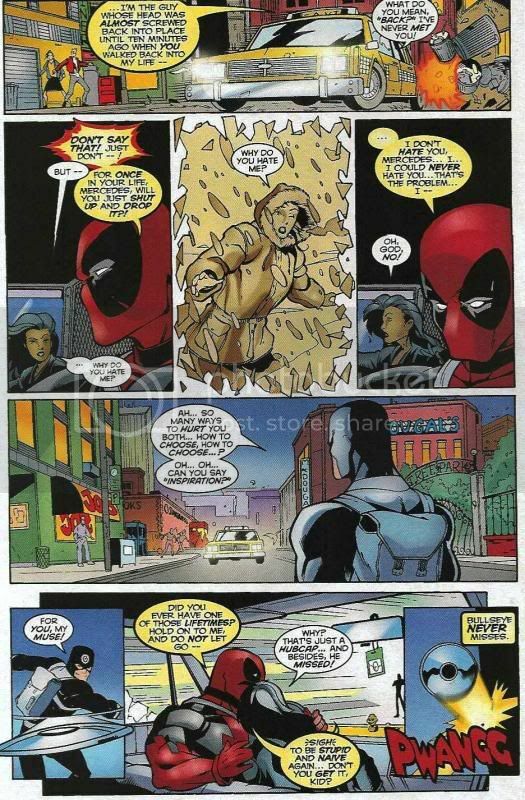 I know Deadpool eventually overcame his shittasticness, but wow did I lose something for him upon discovering just how ... well he said it best: "When did I find time to be that...bad...?"